The glamorous 3 graces of Liverpool waterfront proved to be a fantastic location a major chess event which not only provided a fabulous venue but a city for all the weekends participants to explore with something for everybody to enjoy from the historic Albert Dock, Museums, galleries, bars and restaurants and of course the home of Beatlemania Matthew Street around the corner. 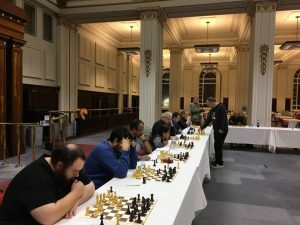 The event was opened by the Lord Mayor Liverpool Malcolm Kennedy attracting visitors from all over the world including many Grandmasters and International Masters to make it a tensely fought competition. GM Danny Gormally was took the top prize being crowned the English Rapidplay Champion title in the Open section. 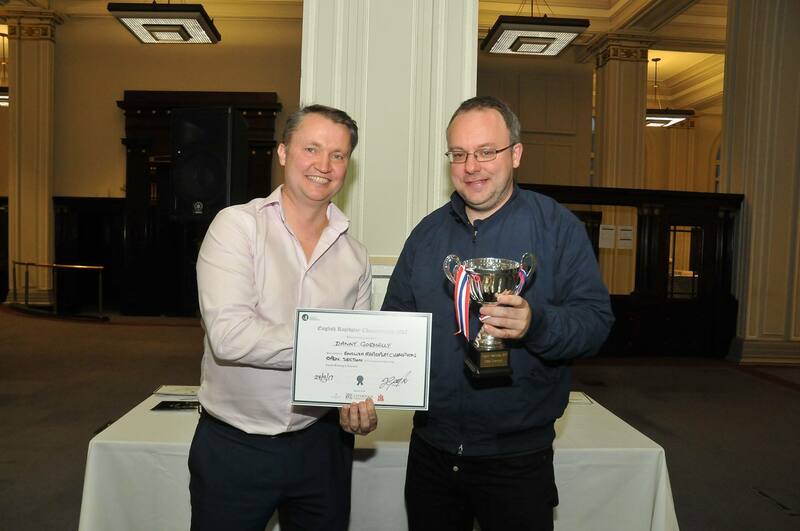 Danny can be seen being presented with his award by the Liverpool Chess Club President Jim Gallagher. Danny had many strong competitors for the title. 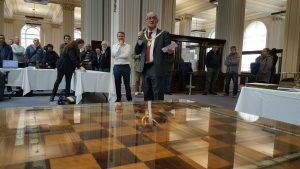 The event which is sponsored by Signature Living was opened today by the Lord Mayor of Liverpool Malcolm Kennedy (pictured) who once played chess in the Merseyside league for Aigburth Chess Club. Three juniors were crowned English Rapidplay Champions today in the fabulous Liverpool Cunard building. Marek Korsinskij of Liverpool was crowned 2017 English Rapidplay Champion for the Under 12 section with Weston Levi of London in 2nd place and Samir Khan of Bath in joint 3rd place with Tarini Jayawarna of Tameside and Liverpools Nickolas Korsinskij, Joshua Roque, Bashar Rovezi and Luke Maher all close behind the leaders. Tengwen Zhao from Sale was crowned 2017 English Rapidplay Champion for the Under 10 section with Rebecca Correa of 3Cs in 2nd place and Shivam Argrawal of Kings College in 3rd place. To kick the congress off in style, on the Friday before the Congress GM Daniel Gormally took on 15 Chess players and was victorious in each game, this was obviously and excellent warm up for main event for him! The event was a major success and hopefully we will all be back again next year for an even bigger tournament.